I finally, finally, FINALLY got my hands on the BEAUTIFUL Zoya Gloss Trio. I mean, can you tell just how excited I am?? Jellies were made for ME!!!! Not only that, but admire my bottle shot above!!! 6 Zoyas in all!! Don’t worry, I’ll bring you some more pictures of all the others soon. 🙂 And I’m also thrilled to try my very first bottle of Soulstice, but more on all that later! That’s only 2 coats of Zoya Frida, a teal jelly beauty that layers amazingly well. For some reason, this Gloss collection has not received the best reviews, but I wonder if that’s because some people just don’t love jellies. I find them to be a very special breed of polish… I compare them to lipgloss – for the nails. It’s not for everybody, but those that love it, LOVE it. And I couldn’t have asked for a more perfect jelly! 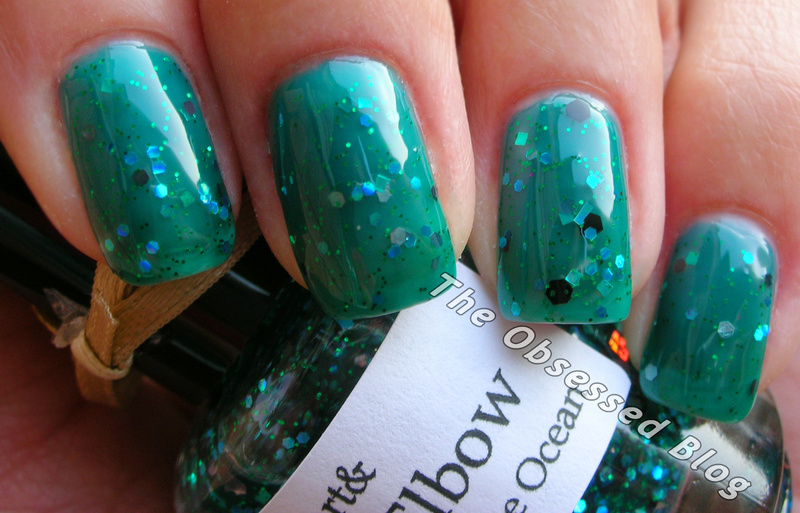 This was one of the best jelly polishes I have tried, by far! The consistency was a little thicker – almost gelatin-like, and you have to work quickly and evenly. But by the time I had applied the first coat, I was able to go back and apply the second without any more wait. And no bubbling! If I was wearing this alone, I would have applied a third coat for sure. The Gloss collection is so glossy, it does not even need a top coat. See the picture above? No top coat and the polish is dry! But I had other things in mind. A beautiful, perfect jelly sandwich!!!! 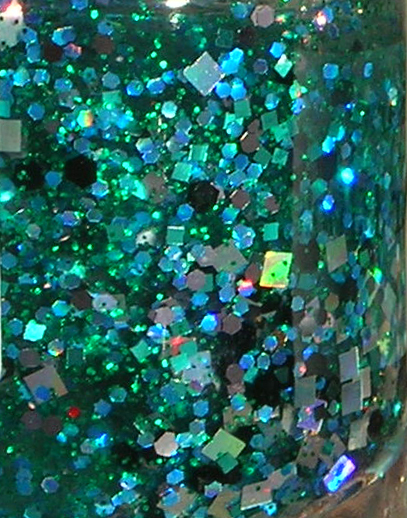 Allow me to introduce you to a new polish line called Kiss Your Elbow Nail Polish, whose gorgeous A Drop in the Ocean I layered between my Zoya Frida. Cassidy, the super-sweet creator behind this brand, recently launched her inaugural line of 6 polishes, and she asked if I would swatch some for her. I keep pretending I don’t like blues and greens when it comes to polishes, but who am I kidding. Blue is actually my favourite colour, and water (especially the ocean) is my very favourite thing. So naturally I always gravitate towards these beauties, and A Drop in the Ocean was no different. And the moment I saw the bottle, I knew I had to layer it with Frida! Let’s let the pictures do the talking! Let’s show Kiss Your Elbow some love on her Facebook page or by checking out A Drop in the Ocean in her Etsy shop! And there may just be a little something happening on my Facebook page soon… maybe a giveaway…? I’ll have more Kiss Your Elbow polish for you again soon! The Zoya Gloss Trio is available directly from Zoya if you’re in the US, or Nail Polish Canada, and I’m not sure just how long they’ll be there! What did you think of Frida? And of A Drop in the Ocean? omg!!!! I need this combo. 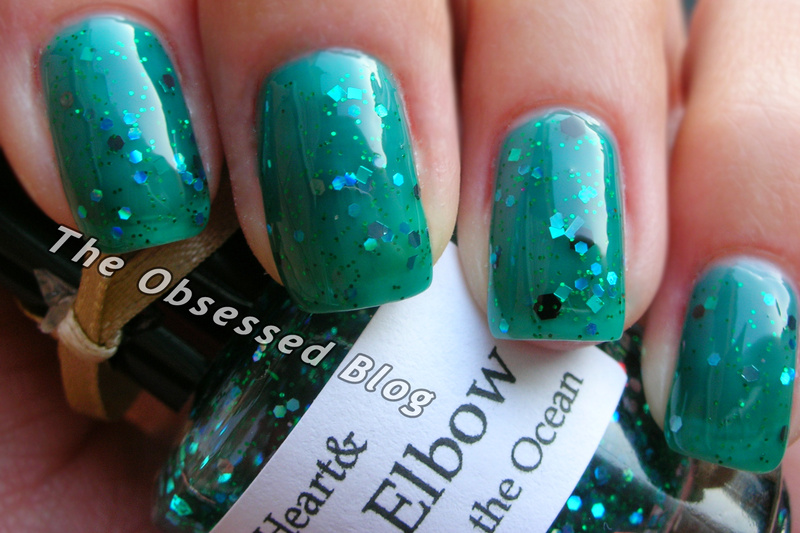 I’m not usually a jelly fan either but this mani is a must for me! so cute!! Omg! I don’t own that many jellies… but i want every single one in the world! They are amazing!! I adore jellies too!